Our featured project last month was a beautiful kitchen remodel we recently completed in Southlake, Texas. Our client’s main goal was to create a more open-concept floor plan and update the interior of their 1990’s home. The project involved completely renovating the kitchen, removing some walls, and relocating the dining room into the larger space that was originally the formal living room. 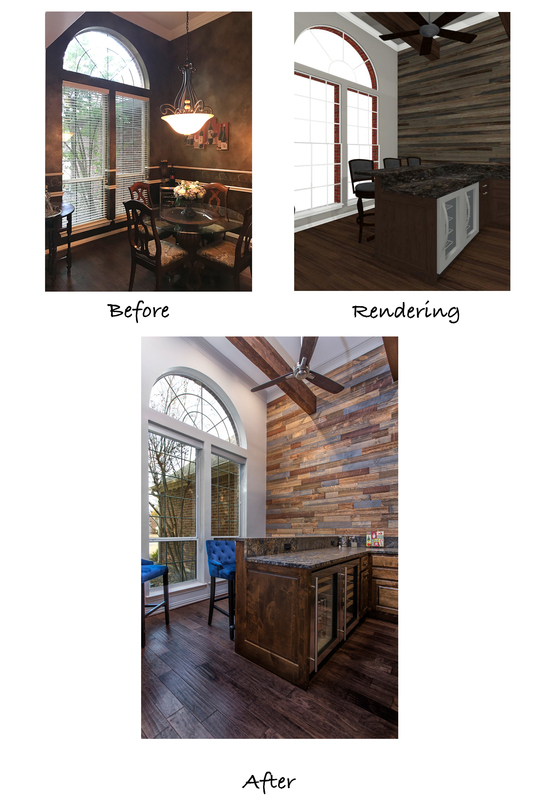 At the end of that blog post, we mentioned that we also designed and built a custom home bar in place of the original formal dining room, just on the other side of the new kitchen. 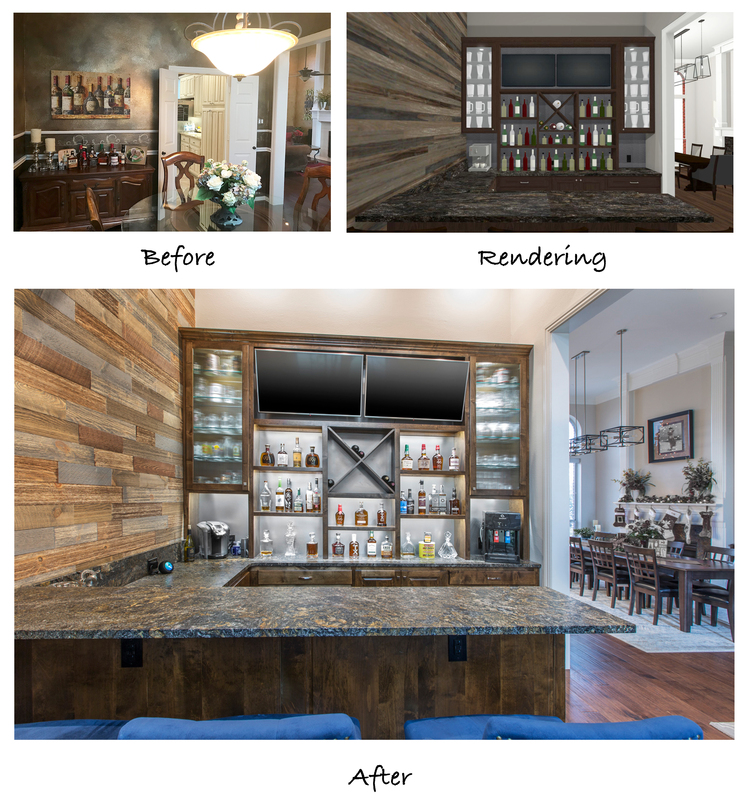 This month, we’d like to share the details of this stunning home bar, from design to completion! As mentioned in the previous blog, our clients loved to host get-togethers of large groups of people in their home. They enjoyed socializing and desired a place guests could sit, mingle, have a few cold ones, and watch the game. As large as the existing living room was, it just didn’t meet the needs of the clients when it came to entertaining guests. 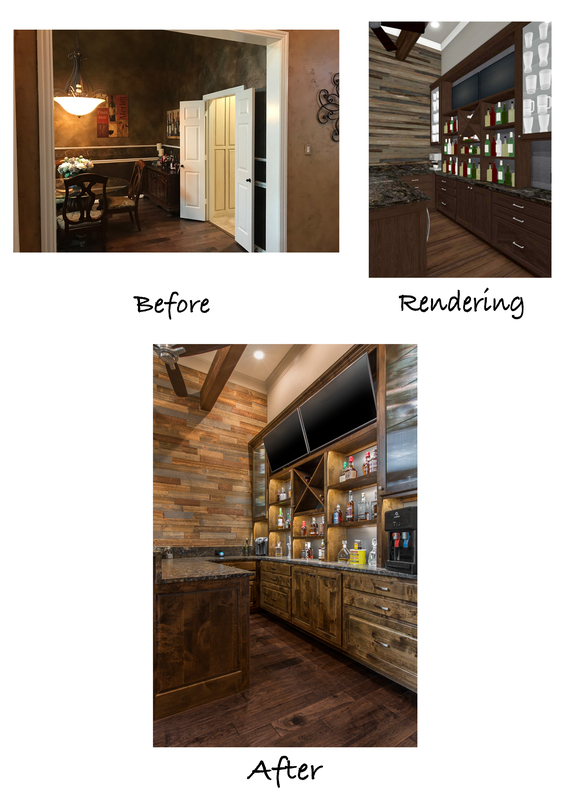 The idea was brought up to convert the formal dining room into a rustic home bar — complete with backlit display shelves, an under-counter wine fridge, granite counter tops, and big screen TVs — and the clients were beyond excited! 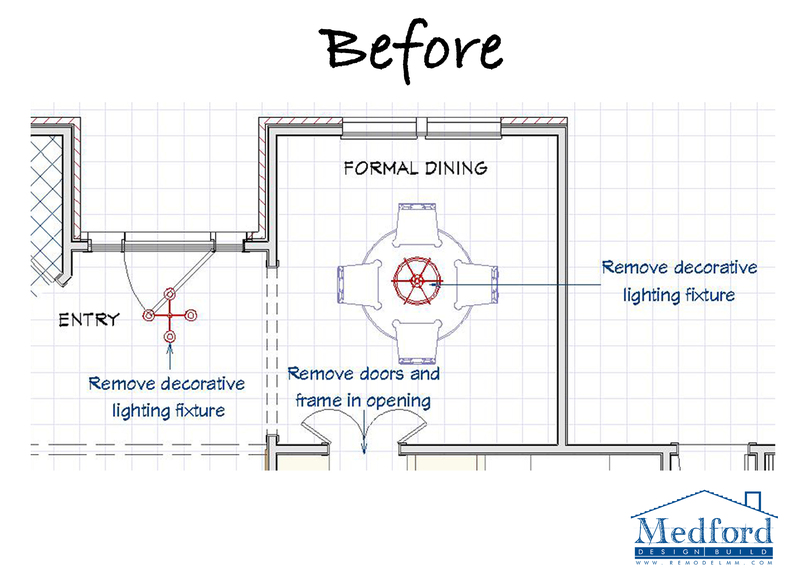 Our talented design team began to draft up ideas for the look and functionality of the remodeled room, and the project was quickly underway. 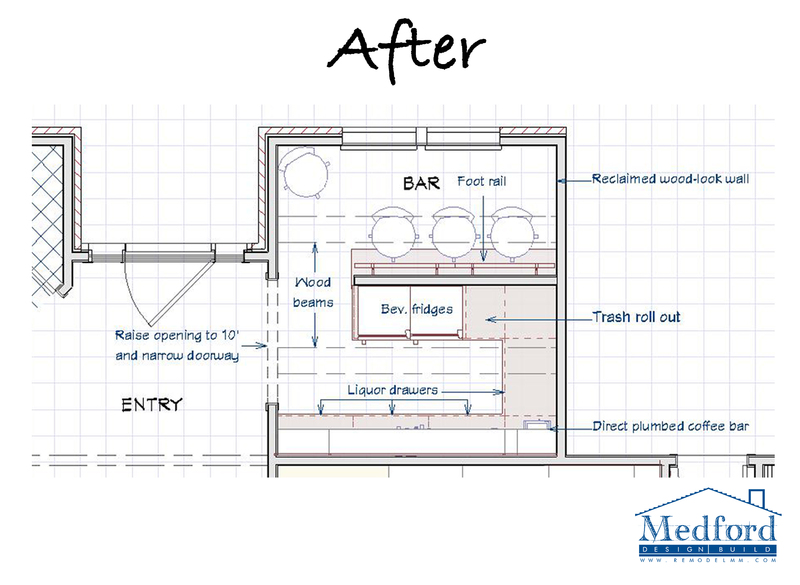 The structural changes of this project involved widening the entrance to the new bar to improve the flow of traffic in and out of the room. This, along with the wall removal between the kitchen and the new dining area, makes the entire home feel larger and more spacious upon entering the front door. The wider entrance also provides a beautiful view of the custom exposed beams our carpenters made and installed in the high ceilings of the bar. Exposed beams are a great way to bring high ceilings down while adding visual interest and detail to a room. 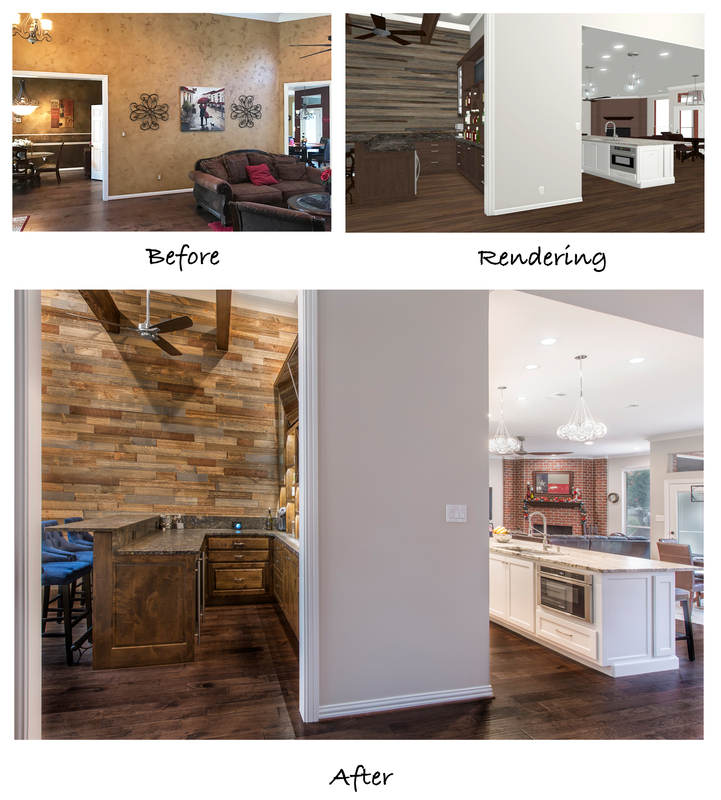 Because our clients wanted a rustic look, reclaimed wood planks from Forever Barn Wood were used to create a show-stopping accent wall in the new bar, highlighted by LED can lights we installed in the ceiling. You’ll also notice that we closed off the doors from the formal dining room into the kitchen. This created the wall space necessary for the back of the bar, as well as the back wall of cabinetry in the kitchen. To prepare the wall prior to installation of the custom shelving, we laminated it with a sheet of metal. This provided a beautiful backdrop and the high-end look the clients were hoping for. The shelving was installed with the purpose of displaying our client’s impressive Bourbon collection. LED backlights spotlight the displays, with tall, glass-front cabinets on each side for glassware storage. Two large angled big screens were installed in the center above the shelving for that authentic sports bar feel. A gorgeous black leathered granite countertop compliments the dark stain of the upper shelving and lower liquor drawers. A coffee station and hot/cold water tap conveniently occupy the ends of this beautiful bar. The reverse side includes a step-up bar and custom foot rail so guests can sit comfortably on the bar stools while chatting and watching the game. Convenient electrical outlets were installed along the splash while wine fridges are within reach just below the counter. A stylish 3-blade ceiling fan is a neat detail included in the design. The finished bar is truly beautiful and really is a unique feature to our client’s home. They now have the perfect place to host guests and wind down after a long day! Structural Design: Mike Medford, Sr.
Production Management: Michael Medford, Jr. 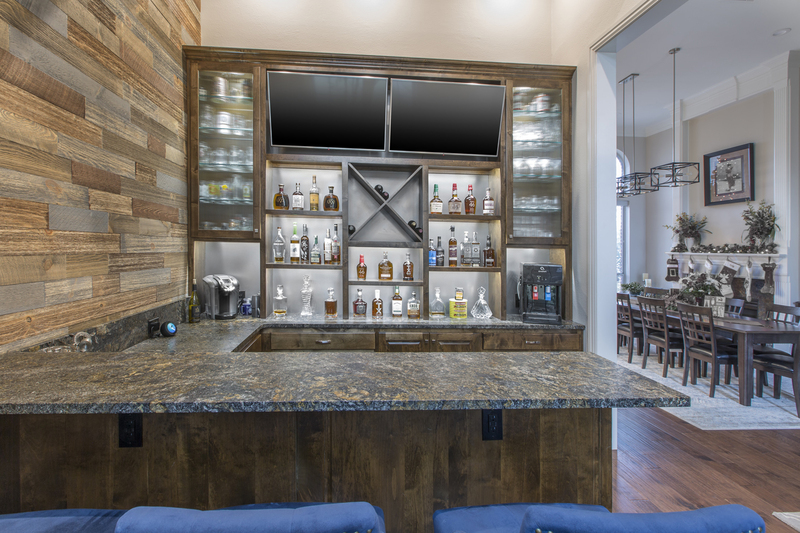 If you are interested in having a custom home bar installed in your home or have another unique remodeling project you’d like to discuss, our team would be happy to help! Contact us today to get started!